Moo0 Anti-Recovery lets you easily erase all the recoverable data from the empty space of your disk drive, leaving the existing data untouched. Have you ever sold/disposed your PC, HDD or USB sticks? Are you really sure nobody's recovered your personal data, such as ID, password, personal photos, credit card number and so on, from them, then? Now, you can be relieved from the fear by using this easy tool. - Fixed a problem in which the program was occasionally failing when wiping the MFT records on C drive, depending on what other programs were running at the same time. FAQ: Some file "names" are still recoverable on FAT drives. This is because we haven't released the procedure to erase recoverable file "names" on FAT drives yet. This is due to the lack of our testing. 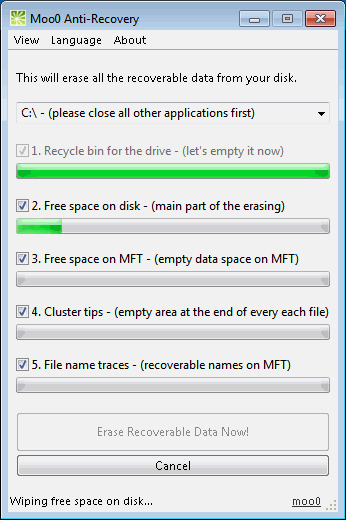 To erase file "names" on FAT drives, the program needs to touch very delicate part of the file system, and we are still not confident enough that our erasing mechanism won't hurt anything on the system. That's why we haven't released the procedure yet in our program. Maybe some data would still "look" recoverable on FAT drives due to this. We'll release the procedure soon, after more descent and heavy testing on FAT drives. but still, at least all "data" must have been surely erased if you completed all the procedures, although the file "names" are still recoverable. We are sorry for the inconvenience.